World Heritage Kakadu National Park offers hikers stunning vistas, unique landforms, abundant wildlife, birdlife in particular, and outstanding Aboriginal rock art. Cruising the East Alligator River along the Arnhem Land border, waters chock-full of crocodiles is another exciting highlight. 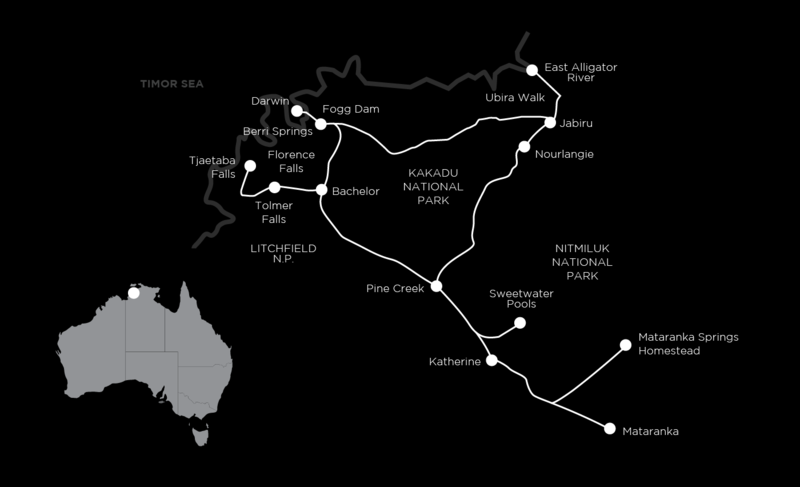 This is a unique Kakadu tour where we will get to places that can only be reached on foot. At Nitmiluk National Park the walking takes you to rugged gorges and remote swimming holes via the rim of Katherine Gorge itself, including one section of the long distance Jatbula Trail. Then there’s beautiful Mataranka Falls, where two rivers meet in watery unison. At Mataranka thermal pool, you can swim in the warm waters then take a dip in one our favourite pools, Bitter Springs, which we’ll most likely have to ourselves. Stunning Litchfield National Park is the grand finale, with sections of the long-distance Tabletop Track and a dozen huge waterfalls that plummet down impressive escarpments. Every last detail is taken care of so you can fully experience all the highlights of Australia’s Top End. Accommodations are comfortable and full of character, complementing the surroundings. Chef prepared breakfasts and dinners make indulgent bookends to most days. On one evening your guides will be out to impress with a BBQ dinner that will be enjoyed under the stars. With two outstanding guides looking after you, it’s easy to pace yourself with a choice of easier or harder walking options along the way. Some hill sections and occasional steps. Walking experience not required. Start in Darwin at 7.50am or Darwin Airport at 8.00am. A fabulous introduction to Kakadu’s wetlands begins with our first walk at Fogg Dam experiencing the wonderful diversity of bird life in the Top End. Next, it’s on to Kakadu World Heritage Area, Mamukala, for an afternoon passing spiring termite mounds, swaying palms trees and savannah country. No Kakadu tour is complete without a stop at the much-publicised Ranger Uranium Mine. Our Kakadu tour continues today with a cruise on the East Alligator River, one of the great northern rivers that forms a boundary with Arnhem Land. The tour is 100% Aboriginal owned and operated, you’ll learn about traditional survival skills and see a lot of wildlife including the famed crocodiles. There’s also opportunity to get off the boat and spend some time in Arnhem Land. We then Ubirr to tackle a short 1km circuit showcasing several fascinating Aboriginal rock art sites. There’s also an optional rock scramble to a lookout for expansive views over the Nadab floodplain. After lunch we enjoy the Manngaree Rainforest and Bardedjilidji Walk, which begins with a monsoon rainforest circuit and then continues along the banks of the East Alligator River. Our final Kakadu walk is in the Nourlangie Rock area, beginning with some stunning Aboriginal art sites. We then continue on the challenging Barrk Walk through remote sandstone country. This hike offers spectacular views of the Kakadu escarpment, culminating in a visit to the Nanguluwur Gallery art site, far away from the tourist crowds. Wrapping up the day, we head south to historic Pine Creek to spend the night. After a one hour drive south, we’ll spend the day in the Edith Falls section of Nitmiluk National Park (Katherine Gorge). The more challenging walk option will be on a section of the long distance Jatbula Trail to Sweetwater Pool. This trail follows the route travelled by generations of Jawoyn Aboriginal people to access the escarpment country. A shorter option to the halfway point of Long Hole Pool will also be offered. There are a couple of excellent swimming options in the pristine river today. At the end of the walk there’s a series of large swimming holes with the impressive Edith Falls plummeting into the refreshing waters. Bring your swimming goggles – there’s a whole bunch of interesting life to explore underwater. Head south for the day to the Mataranka area for a fabulous walk to Mataranka Falls – one of our all-time favourites. Two large rivers meet here and there are waterfalls and picture-perfect pools to swim in. This fabulous day culminates with the amazing Bitter Springs where you can float downstream in a warm, crystal-clear stream. Spend the day in the Katherine Gorge section of Nitmiluk National Park. Our chosen route parallels the mighty river, dropping down to the banks for a refreshing swim. A more challenging walk option includes the Baruwei Walk, Butterfly Gorge and Southern waterhole (an easier option is available). Depending on your preference, cruise along the river, go kayaking or enjoy a helicopter trip to a remote section of the gorge (at own expense). Head northwards to Litchfield National Park to see massive termite mounds and embark on two walks this afternoon. The first is to a viewing point over Tjaetaba Falls. The second is to one of the most spectacular waterfalls in the park, Wangi Falls. There will be time for a swim in the delightful waterhole at the falls. The water in the pools at Litchfield has an incredible clarity that makes swimming here a real highlight. A choice of walks today. The harder, longer option is a section of the long distance Tabletop Track from Walker Creek to Florence Falls. This is remote, challenging walking and a dip in the pool below Florence Falls will be a welcome end to the hike. The easier option will include a visit to historic Bamboo Creek Tin Mine (1.5km, easy), and a swamp area that has many water birds. Then there’s a walk from Florence Falls to Buley Rockhole with plenty of time for swimming en route. For our final day, we’ll leave Litchfield and head for Berry Springs, en route to Darwin. This is a crystal clear natural spring with a waterfall and excellent swimming in the warm spring water. There’s a short forest walk here too. We’ll travel back to Darwin, arriving at about 1.30pm. The tracks are mostly graded and easy to negotiate. Full day walks average about 14km and are mostly flat but sometimes on rocky surfaces. There is an opportunity for fit walkers to challenge themselves on some of the days with rather lengthy walks of up to 20km. This is the remote Top End, thus the accommodations reflect the area’s character and are in memorable locations. More importantly, they’re comfortable and provide a great place to relax after a day on the track. All the rooms have ensuites. The dinners are two to three course a la carte meals prepared by chefs at restaurants, as well as our excellent guide prepared dinner under the stars, and the unique stockmans camp tucker dinner. The food is contemporary but there is an opportunity to eat bush tucker, barramundi and other Top End specialties. Most days you will wake to a cooked breakfast to ready yourself for the upcoming days walk. Lunch will be enjoyed at incredible locations along the track. The walkers lunches are comprehensive ensuring that your appetite is always satisfied. The track is generally well graded and relatively easy to navigate. Full day walks average about 14 to 15 km. The walking on the Kakadu tour section is moderate with one optional more challenging walk. At Katherine Gorge the walking becomes a little more challenging with many of the tracks being rough and rocky. At Litchfield and Mataranka the walking is easy to moderate, with a few optional challenging sections. All the hardest sections of the walking is scheduled for the mornings. There are some great opportunities for fit walkers to challenge themselves. However, for the most part the walking reflects the regions laid back attitude, as walkers can enjoy themselves at exploring places only accessed on foot. This trip operates with two professional guides ensuring that you have both a safe and enjoyable walking holiday. Knowledgeable of the Top End, including wildlife and the region, they can offer easier and harder walk options along the way. Please contact the office if you need further advice, or would like to speak with one of our guides. Pre and post tour accommodation: There are many good hotels in Darwin, however we pick up and drop off from one central hotel, the Mantra on the Esplanade, 88 The Esplanade, Darwin. The tour starts at 7.30am at the Mantra or 7.50am at the airport. We arrive back in Darwin on the last day at about 1.30pm. We only offer this holiday during the winter months, when daily temperatures are the lowest for this region. It can still be quite warm to hot on occasions but, as mentioned above, there is usually a refreshing waterhole close at hand for a swim. See the Bureau of Meteorology for information about temperatures and rainfall ahead of time to ensure proper clothing. If you have any questions about the walking Australia’s Timeless North walking trip, feel free to ask one of our destination consultants or to speak with one of our guides. You can get in touch with us via our contact form, email us at info@auswalk.com.au, or call us on +61 3 9597 9767.